Exclusive collection of professional sound programs contains vintage synth emulations, synth pads, synth basses, synth leads and synth programs specially designed for using with Kurzweil PC3K internal arpeggiator. The PC3K:Works - Synth Collection is a special bundle including our PC3K:Works - Synth Collection (Volume 1 - Volume 6). Note: This soundware collection is designed for Kurzweil PC3K synthesizers without optional ROM boards installed. PC3K:Works – Synth Collection is specially designed for Kurzweil PC3K8, PC3K7 and PC3K6 synthesizers. Most of the PC3K:Works sound programs support the Kurzweil PC3K keyboard velocity, press sensitivity and also onboard MIDI controllers. The controller sliders and wheels are used especially for synth basses, ARP/SEQ and Sync programs. Important note for Kurzweil PC3K users: The PC3K:Works – Synth Collection requires the Kurzweil K2600 compatibility file to be loaded in your synthesizer. 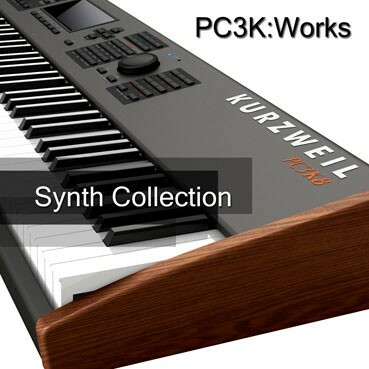 The all PC3K:Works – Synth Collections are provided with our PC3:Works – Synth Collections designed for Kurzweil PC3 synthesizers. The PC3:Works – Synth Collection does not require above described Kurzweil K2600 compatibility file installation. However, we highly recommend to use the PC3K:Works - Synth Collection. The main advantages of the PC3K:Works version over the PC3:Works one are more number of the sound programs, better sonic quality of some synth pads, synth basses and vintage emulations based on original Kurzweil K2600 saw and square oscillator samples.